Dr. Stanley Kabala Duquesne University Click here to begin. 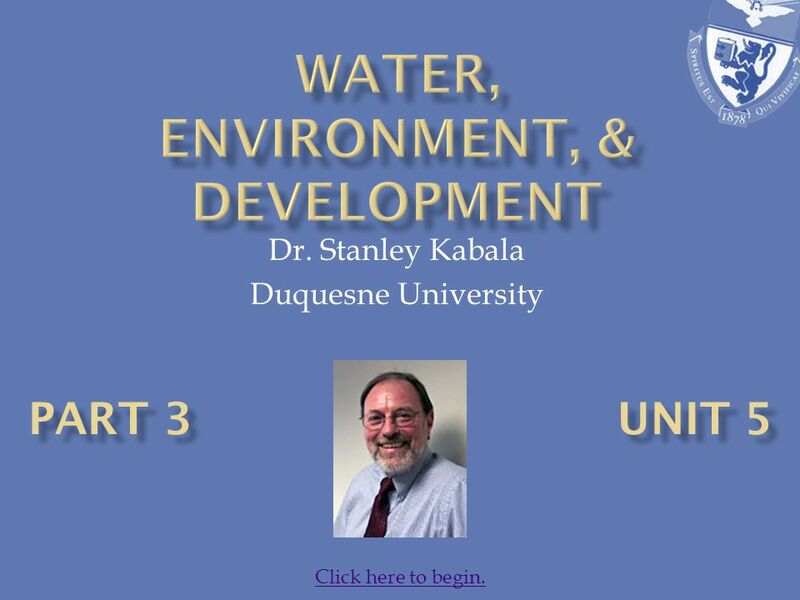 1 Dr. Stanley Kabala Duquesne University Click here to begin. 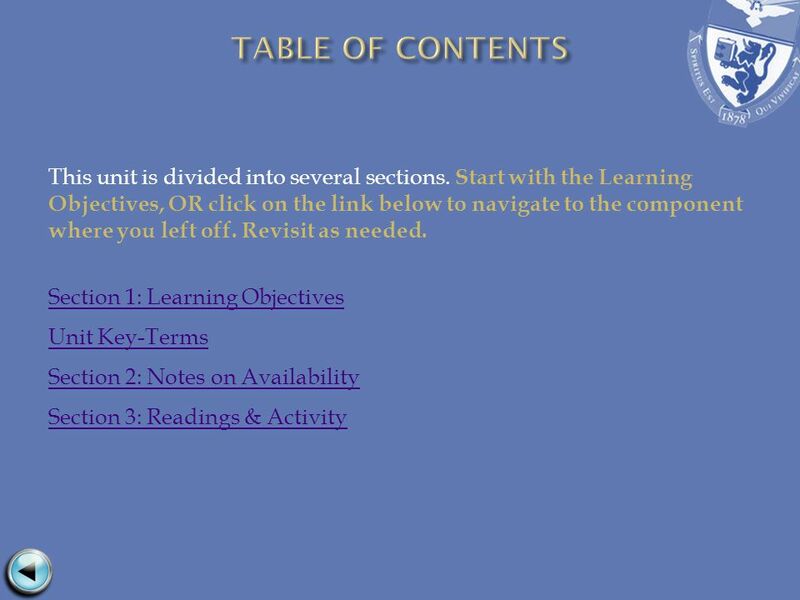 2 Navigation through the course will occur by clicking on the following action buttons located in the lower right corner of each screen: The HOME button will be placed in the center of each slide and will bring you to the Table of Contents for further navigation. The NEXT and BACK buttons will move you through the course content. 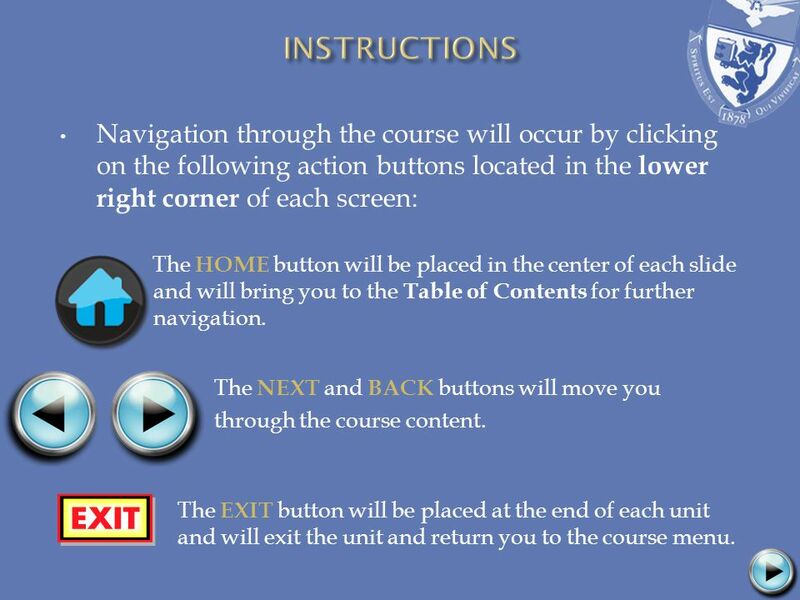 The EXIT button will be placed at the end of each unit and will exit the unit and return you to the course menu. 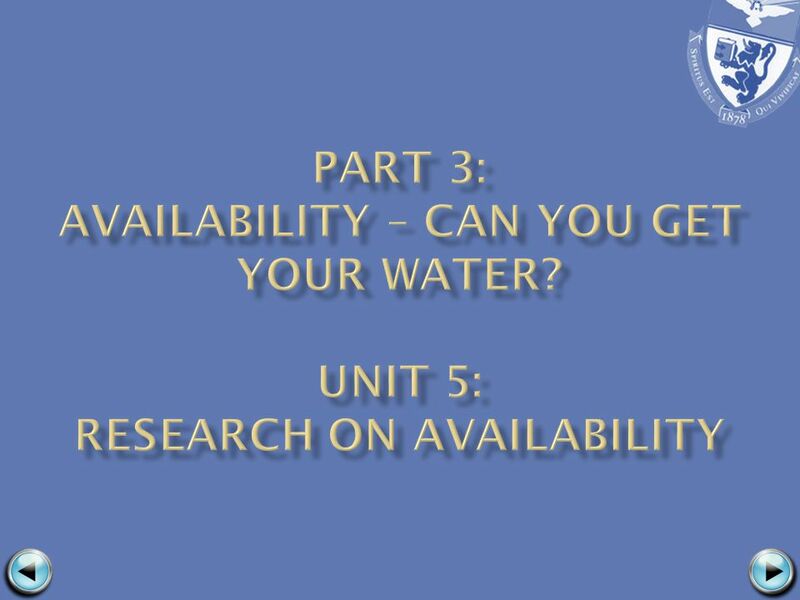 11 In this unit, we assess how availability of water is influenced by resource limits, technology, financial arrangements, and decision making patterns. 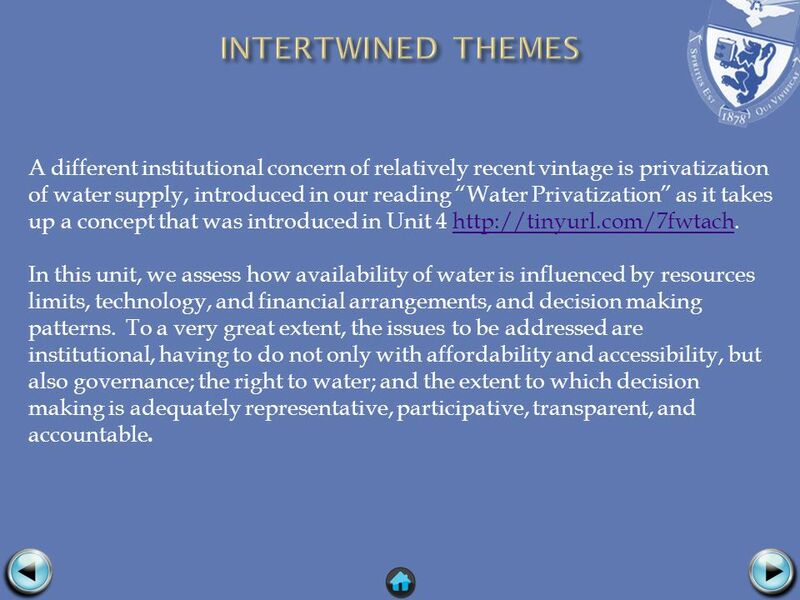 To a very great extent, the issues to be addressed are institutional, having to do not only with affordability and accessibility, but also governance; the right to water; and the extent to which decision making is adequately representative, participative, transparent, and accountable. Let us take up each of these themes separately. 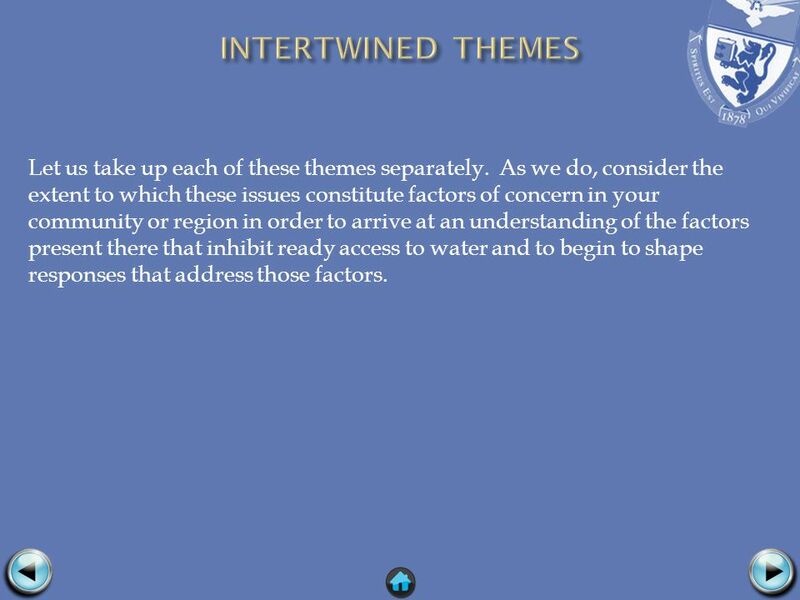 As you do, consider which of these issues constitute factors of concern in your community or region first to arrive at an understanding of the factors there that inhibit ready access to water and second to begin to shape responses that address those factors. 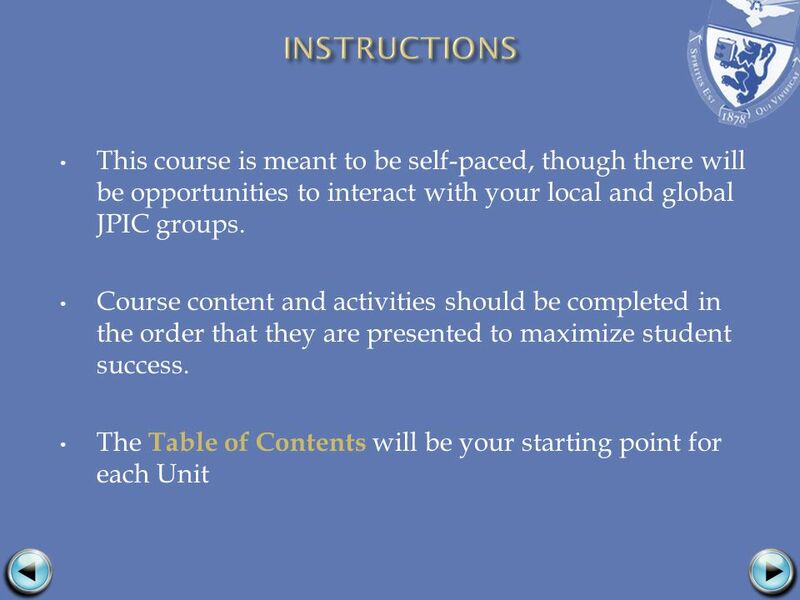 This is a further step toward focusing your course project portfolio. 12 The terms decentralization and devolution as they apply to institutional authority have slightly different meanings. Decentralization for the most parts refers to the geographic or territorial diffusion of institutions and decision making structures. It implies that some matters can be handled effectively—and perhaps more expeditiously and even more cheaply—at the local rather than regional level or the regional rather than national level. Such matters are usually defined by their scale, with relatively smaller ones handled at lower levels. The other side of the matter, of course, is that at lower levels fewer resources are available to direct to resolution of an issue, and resources must be sought from a higher level. 13 Devolution typically refers specifically to the actual administrative structures of government that have responsibility for carrying out policies and programs. Thus, while decision making might be decentralized geographically, authority for that decision making in housed in specific offices or agencies. At the local level, these are those of town councils, mayors, or tribal chiefs and elders. At the regional level, they are the regional or state governors or state legislative bodies if such exist. And of course, at the national level these are the Parliament, the President, the Prime Minister, and the Ministries. 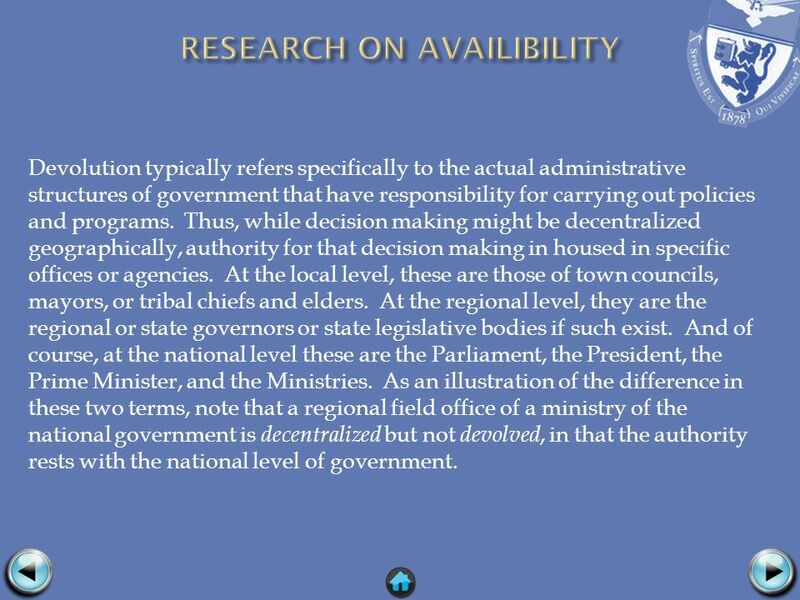 As an illustration of the difference in these two terms, note that a regional field office of a ministry of the national government is decentralized but not devolved, in that the authority rests with the national level of government. 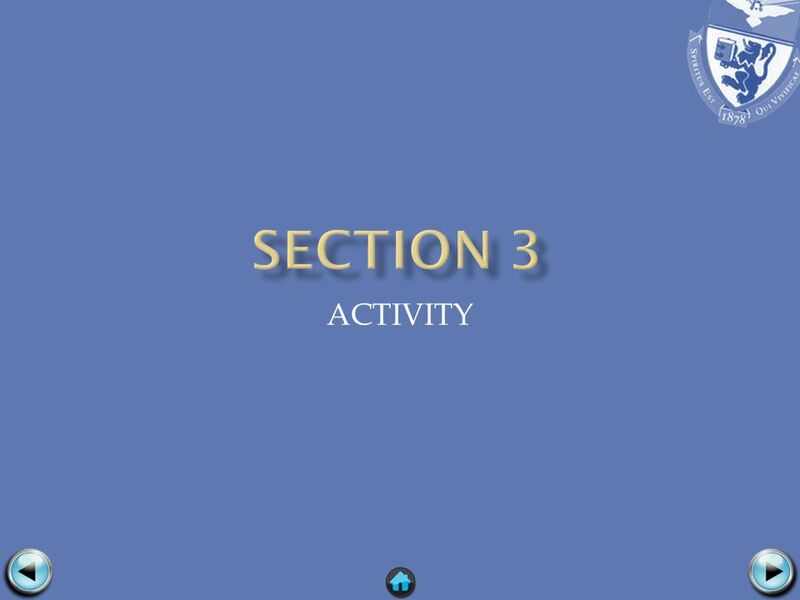 14 What has this to do with participation in decision making? Simply put, if people have full and ready and affordable means of travel and access to modern communications, as well as entrée to centers of decision making, then decentralization and devolution of institutions are less significant. However, if people cannot travel long distances, or can do so only with difficulty or at high cost, and they do not have access to convenient and affordable communication, then the distance to centralized centers of decision making constitutes a real barrier to their ability to participate in those aspects of policy making that will affect them. 15 Accountability refers to the extent of control exercised by a constituent group over those charged with decision making. In a word, decision makers, however they gain their authority, are answerable to those in power. The question then becomes, “Who is in power?” This is entirely a political question, one that people attempt to frame with the governmental institutions they set up. All too often, the chain of accountability links to those with economic or hereditary power. Democratic institutions aim to tie that accountability to the general citizenry rather than leaving in the hands of political, ethnic, hereditary, or economic elite. 16 Inclusiveness and representativeness are the hallmarks of democratic decision making. These terms mean that, in the first instance, all those who have a stake in a matter have access to decision making if they choose to take part, and, in the second instance, that inclusiveness is generally takes into account the points of view of all relevant stakeholders in a way that roughly reflects their presence in the larger community, society, or country. Taken together, inclusiveness and representativeness, when actually practiced, make for fairness, since no one’s view is left out and no one (or few) can impose a decision on others. Non-inclusiveness and non- representativeness are often subsumed under the term disenfranchisement. 17 Transparency refers to the degree to which the ordinary citizen can review the full process of decision making, including deliberations leading up to making policy. High transparency is a powerful tool of democratic systems. It allows for citizen access to information and enables oversight of elected officials, both of which greatly enhance the quality and effectiveness of citizen participation in policy making. Coincidentally, but not surprisingly, it also greatly reduces the possibilities for corruption. 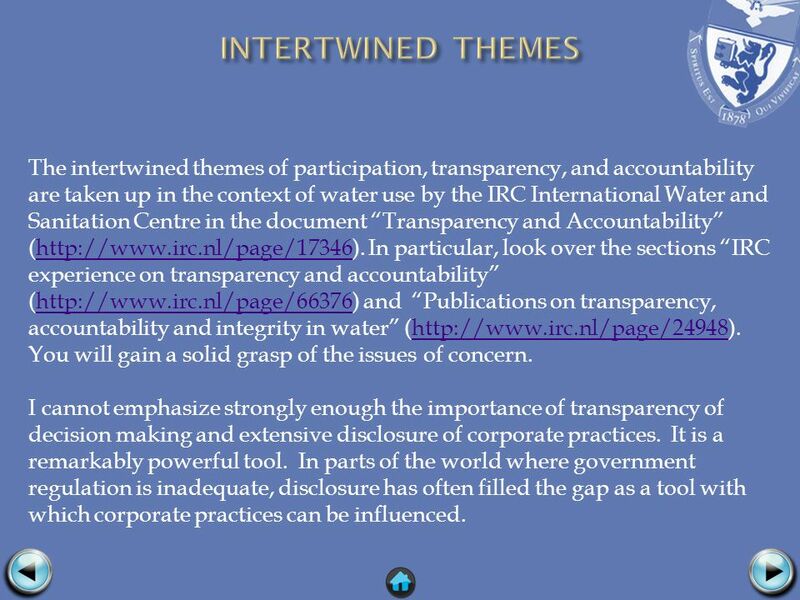 18 The intertwined themes of participation, transparency, and accountability are taken up in the context of water use by the IRC International Water and Sanitation Centre in the document “Transparency and Accountability” (http://www.irc.nl/page/17346). 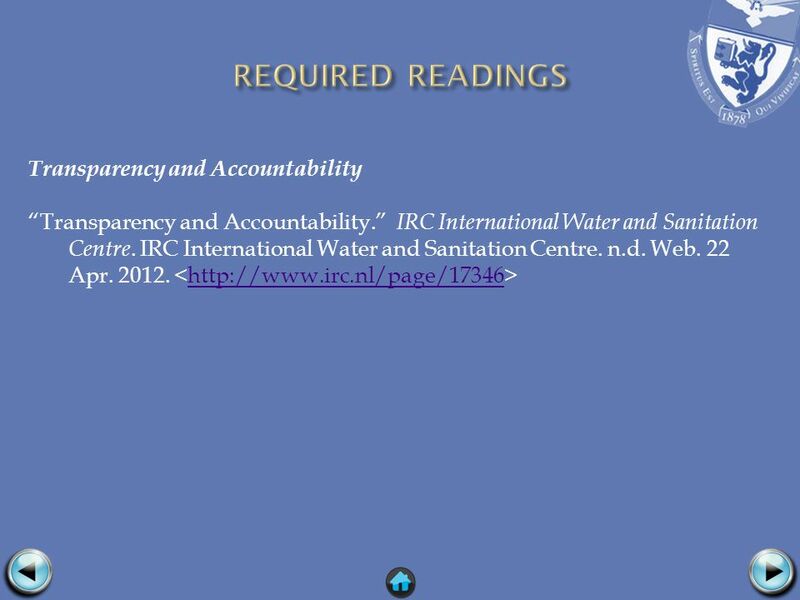 In particular, look over the sections “IRC experience on transparency and accountability” (http://www.irc.nl/page/66376) and “Publications on transparency, accountability and integrity in water” (http://www.irc.nl/page/24948). You will gain a solid grasp of the issues of concern.http://www.irc.nl/page/17346http://www.irc.nl/page/66376http://www.irc.nl/page/24948 I cannot emphasize strongly enough the importance of transparency of decision making and extensive disclosure of corporate practices. It is a remarkably powerful tool. In parts of the world where government regulation is inadequate, disclosure has often filled the gap as a tool with which corporate practices can be influenced. 19 In fact, even in More Developed Countries (MDC) with a history of mature regulatory systems, disclosure plays the same role. In a word, information is power, and possessing information can level the playing field of decision making when the opposing actors are unevenly balanced. At those times when decisions over ownership, supply, delivery, and pricing of water are in the hands of a third party entity such as a government entity or private company, the ability to receive— or demand —records of policy decision making can influence positive outcomes. 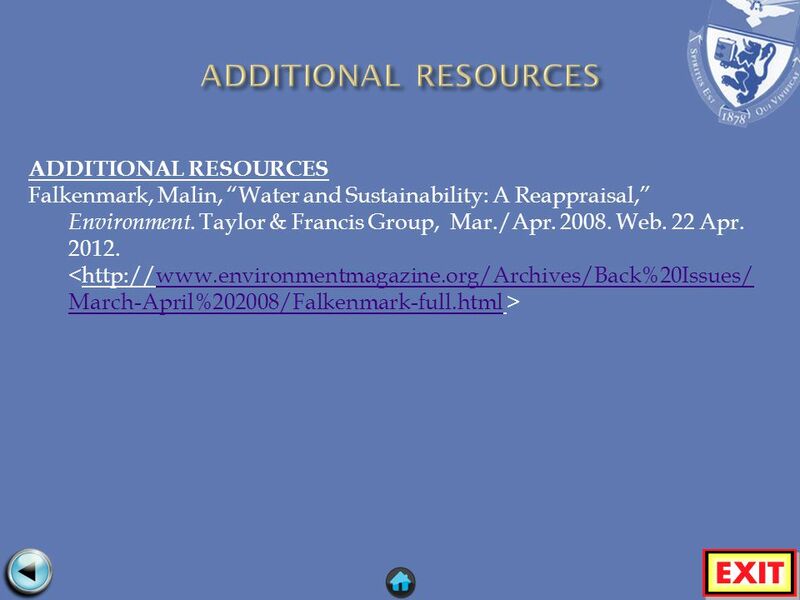 20 A different institutional concern of relatively recent vintage is privatization of water supply, introduced in our reading “Water Privatization” as it takes up a concept that was introduced in Unit 4 http://tinyurl.com/7fwtach.http://tinyurl.com/7fwtach In this unit, we assess how availability of water is influenced by resources limits, technology, and financial arrangements, and decision making patterns. 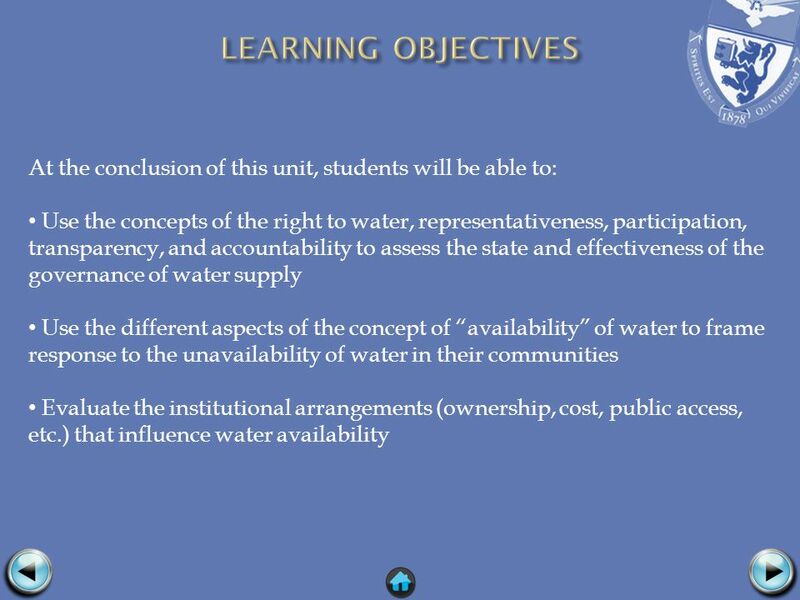 To a very great extent, the issues to be addressed are institutional, having to do not only with affordability and accessibility, but also governance; the right to water; and the extent to which decision making is adequately representative, participative, transparent, and accountable. 21 Let us take up each of these themes separately. 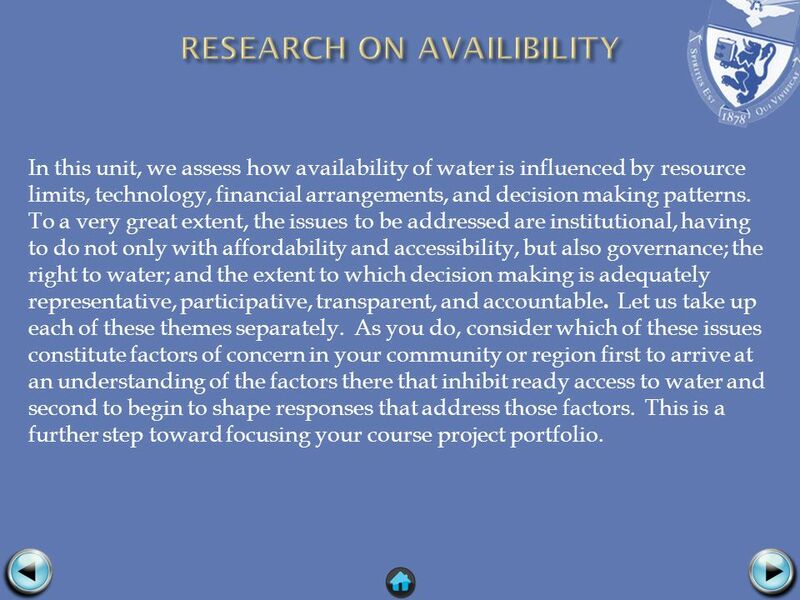 As we do, consider the extent to which these issues constitute factors of concern in your community or region in order to arrive at an understanding of the factors present there that inhibit ready access to water and to begin to shape responses that address those factors. 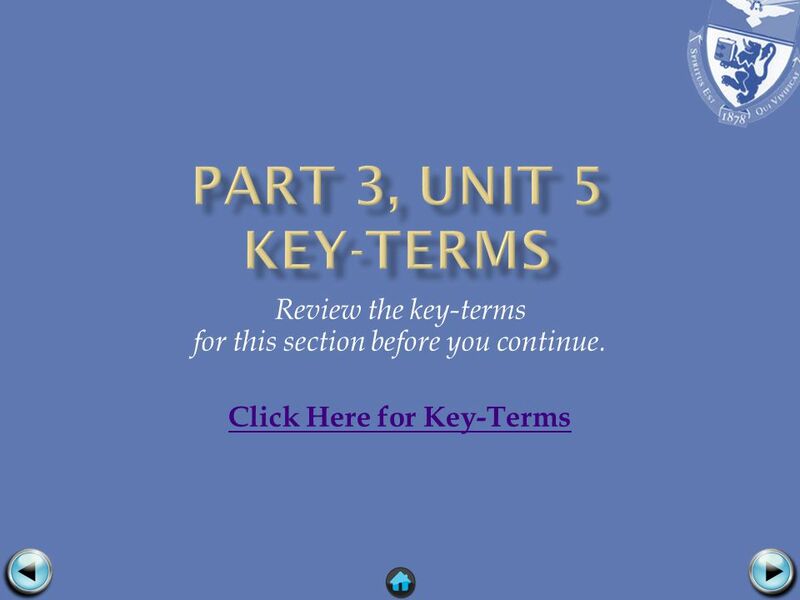 23 Your activities for this unit follow the concepts introduced above. To delve into those concepts and pursue these activities, consult the unit readings that pertain to particular concepts. 24 1.Who makes decisions on water matters in your community and region? Is the authority to do so based on custom, law, or contract? Are these actors individual or collective, formal (governmental) or informal (community)? How are decision makers selected? Who or what gives them their legitimacy? Is it custom, law, election, or dictate? To whom or what are these decision makers accountable? 25 2.Clarify the water ownership arrangements in your community and region. Are these primarily formal/contractual or customary? Has this situation changed in recent years or is it changing now? What do you identify as the implications of this for your community? 26 3.Identify the formal, i.e., governmental, institutions that make and implement water policy? At what geographic/territorial or institutional level of government do they operate? Determine the range of separate and shared authority over policy. 27 4.Assess the degree of inclusiveness, representativeness, participation, and transparency that characterizes the governmental entities making water policy. Evaluate whether this is a factor in making clean water available to everyone in the community or region. Download ppt "Dr. Stanley Kabala Duquesne University Click here to begin." Decentralisation 1 Corinne Waelti, seecon international gmbh. An open system approach to decentralisation and local governance Harmonisation, Decentralisation and Local Governance. Dr. Maureen OBrien, Ph.D. Duquesne University Click here for instructions. Institutions Want stable democracy? Get the institutions right! Moni McIntyre, Ph.D. Duquesne University Click here for instructions. Open Public Services Listening Exercise Summary November 2011. © Curriculum Foundation1 Part 1 How can we build on the notion of ‘leaves’ and ‘roots’ to refine curriculum design? Part 1 How can we build on the notion. INTERNATIONAL UNION FOR CONSERVATION OF NATURE. 2 Implemented in 12 countries of Africa, Asia, Latin America and the Middle East, through IUCN regional. Cross-Border Infrastructure: A Toolkit Barriers to Cross-Border Infrastructure Development Session on Regulation & Accountability The views expressed here. Can global integrity indicators identify operational entry points for anticorruption reforms? 1 Course on Actionable Governance Indicators: Making AGIs. Regulatory Frameworks in OECD countries and their Relevance for India Nick Malyshev Senior Counsellor Public Governance and Territorial Development OECD. Defining decentralization. What Are the Different Kinds of Decentralization? There are a variety of ways in which a government can cede or share power. Curriculum Project Garred Kirk. EARL 1: Civics The student understands and applies knowledge of government, law, politics, and the nation’s fundamental.